OMG! my boss just asked me to plan our team’s outing event! Improv Land Experience, one of the many experiences that we offer at Unarthodox. 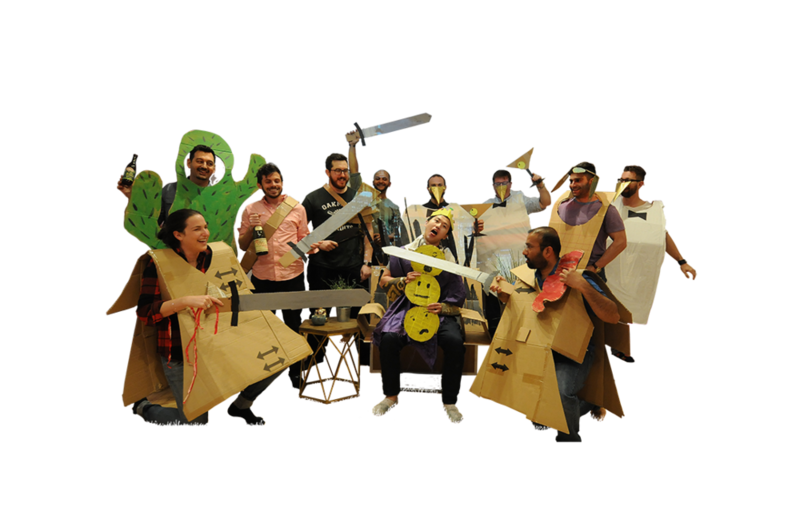 Our instructors will design interactive improv games specifically for your team that will start with fun, ice-breaker games and transition into storytelling and collaboration exercises. Sound familiar? There are so many thoughts that run through your mind when planning a company event, especially, if your reputation depends on it. Making sure everyone enjoys themselves, ensuring that the venue has a comfortable environment, making sure that your colleagues are entertained & engaged, and hoping that they have the opportunity to naturally bond, are only a few of many worries and concerns that every event planner has. And you’re not even an event planner! Roll up your sleeves and get to work, you have a long journey ahead of you...or do you? You’re in New York City, baby! This can’t be that hard. Something new, fun, affordable, convenient, and memorable? Piece of cake. Let’s start with your in-house research team – Google. You type in “Fun things to do in New York City”...search! Seven hundred and eighteen million results. (It’s true, look it up). Now you’re panicking again! Ok, let’s narrow it down to “fun team outing ideas NYC”. Only 10,200,000. Well, that’s a bit more manageable. Yeah right! After three hours of researching, you have narrowed it down to 10 potential places. How about the reviews? You have to make sure that the place is “good enough” for your team. Is it a reputable place? Is it clean? Is it presentable? Is it in a good part of town? Once you determine that any particular place is “good enough”, you need to consider your budget – can we afford this? Oh yeah, you still have to take into consideration where to eat and drink. Back to your research team. Same list of questions and concerns apply. Fortunately, there’s Unarthodox. Make one call, and all the above go away. You no longer need to plan anything because it has already been planned and proven to work. Located in a Landmarked Arts Building, in the heart of Chelsea, Unarthodox is a unique, sophisticated and more importantly, fun space for your team to explore their creativity and interact with one another. Need something fun and unique? – Check! Need good food? – Check! Need wine and beer? – Check! Need the entire event to go smoothly? – Check, check & check! More importantly, you will walk away the hero. Check out unarthodox.com and get more information. Or simply call us, we would be happy to suggest the perfect event for your team. You know, I've always questioned authority. Not the type that comes from laws and regulation, but the virtual type. The authority that is enforced by society and fueled by expectations, trends, responsibility, traditions, etc. For instance, we are constantly judged by our peers based on what we do for for a living. One of the first thing one asks when meeting someone new (especially in a professional environment) is, “So what do you do?” There are assumptions and expectations that are made instantly, simply by what your profession is. But who cares what you do, it doesn’t define you. At least for the most part. I, on the other hand, ask, so what do you do…for fun? Immediately I get an “oh!…ok…umm…for fun?…umm”. My theory is that the topic of fun, really opens up the window to genuine conversation. What a person does for fun, tells me more about them than what they do for work. Eventually, the “work topic” comes up but doesn’t dominate the conversation. Fun is to you keeping your mind sane as sleep is to repairing your body. If you don’t get the right amount of sleep, you don’t physiologically function properly. If you don’t get enough fun, you’ll go freaking crazy. And this is what I'm interested in…the fun factor. Keeping the mind sane is like learning a language. You have to be immersed in it or practice it often, otherwise, you will never be good at it. It’s like the sharpen your saw theory. Sharpening the saw means preserving and enhancing the greatest asset you have–your mind. If you are constantly cutting down trees without sharpening your saw, your productivity level will eventually drop to zero. You work ten times as hard, to only achieve 10% productivity. So this is why fun is the basis here at Unarthodox. Our mission is simply to provide a platform where groups and individual, can create, explore and experiment with their creativity, while socializing and simply having fun! When was the last time you actually created something just to create? Not just art, but anything. A long time I would assume. When was the last time you experienced something completely different? We are all born with the desire to express ourselves. And one of the few ways to truly express yourself, is being creative, making art, and enjoying it. Not just painting, sculpting and writing, but also performing, moving, and dancing. Creative expression can benefit your brain and mental health to make you a happier, healthier person. Art encourages creative thinking, enhances problem-solving skills, boosts self-esteem and provides a sense of accomplishment. Creating art increases the “feel good” neurotransmitter dopamine. Dopamine has been called the “motivation molecule.” It boosts drive, focus, and concentration. Our focus at Unarthodox is to offer team building and team outing experiences with a fun, artistic or “Unarthodox” twist. We don’t like to call it team building, we say Productive Fun! Telling your colleagues or employees that you’re all going to a team building activity instantly puts on pressure and expectations. “Oh, I guess I’m going to have to pair up with Karen, ugh, I don’t want to pair up with Karen” This instantly creates pressures and assumptions on how something is going to go…stressful! So at Unarthodox, we sort of…disguise this. It’s like telling kids that what they are about to eat, although delicious, has vegetables in it. Cue in the apprehension and skepticism. We designed all of our experiences to appear like they are simply a good time but secretly hide, well…the vegetables. It not only tastes good, but it’s good for you too! Or, it’s not only fun, but productive. You get the comparison. So forget the charts, deadlines, and responsibilities for a couple of hours and come sharpen your saw! I guarantee that you will have a blast!